Ar Horqin Banner (Mongolian: ᠠᠷᠤ ᠬᠣᠷᠴᠢᠨ ᠬᠣᠰᠢᠭᠤ Aru Qorčin qosiɣu; simplified Chinese: 阿鲁科尔沁旗; traditional Chinese: 阿魯科爾沁旗; pinyin: Ālǔ Kē'ěrqìn Qí) is a banner of eastern Inner Mongolia, People's Republic of China. 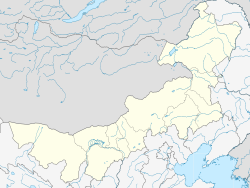 It is under the administration of Chifeng City, about 200 kilometres (120 mi) to the south-southwest. The banner lies on China National Highway 303, running from Ji'an, Jilin to Xilinhot, Inner Mongolia. The Mongolian dialect spoken in Ar Khorchin is not Khorchin, as the name suggests, but Baarin. This page was last edited on 10 December 2018, at 05:57 (UTC).